Andrea Palladio (1508­-1580), one of the most famous architects of all time, published two enormously popular guides to the churches and antiquities of Rome in 1554. Striving to be both scholarly and popular, Palladio invited his Renaissance readers to discover the charm of Rome’s ancient and medieval wonders, and to follow pilgrimage routes leading from one church to the next. He also described ancient Roman rituals of birth, marriage, and death. 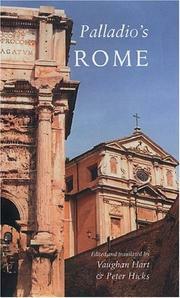 Here translated into English and joined in a single volume for the first time, Palladio’s guidebooks allow modern visitors to enjoy Rome exactly as their predecessors did 450 years ago. Like the originals, this new edition is pocket-sized and therefore easily read on site. Enhanced with illustrations and commentary, the book also includes the first full English translation of Raphael’s famous letter to Pope Leo X on the monuments of ancient Rome. For architectural historians, tourists, and armchair travelers, this book offers fresh and surprising insights into the antiquarian and ecclesiastical preoccupations of one of the greatest of the Renaissance architectural masters.